To stare into the eyes of a wild animal in its natural environment is a thrilling experience. I’ve had close encounters with flamingos, sloths, howler monkeys, quetzals, guanacos, giant toads, giant stick insects, and once even a jaguar. Sadly, however, a lot of the “wildlife” I meet in Latin America is not alive at all. It’s road kill. 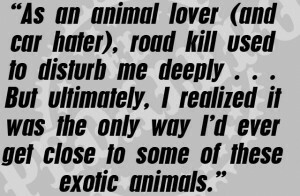 As an animal lover (and car hater), road kill used to disturb me deeply. When I first started bike touring, I couldn’t even look at it. But ultimately, I realized there was nothing I could do and, truth told, it was the only way I’d ever get close to some of these exotic animals. So I developed a coping strategy. I call it the Road Kill Zoo. I pretend it’s all one big zoo and the dead animals are exhibits. When I’m riding near human populations, the specimens are less exotic (dogs, donkeys, chickens). But out in the campo there’s no predicting what I might see in the Road Kill Zoo. The Snake Exhibit is well stocked. I’ve seen partially flattened (and also surprisingly well intact) snakes of every size and colour. Because they can’t move quickly on the road (and often have a hard time finding the other side) they’re some of the most frequently exhibited inhabitants of the RKZ. I’ve also seen many “almost-road-kill” snakes slither in front of vehicles, narrowly avoiding death as they flap forward wildly on traction-free asphalt. Also on display in the Reptile House are many kinds of lizard. Unfortunately, I have no idea what any of them were – the displays in the RKZ are not very informative. I know one was a tegu. I think they’re mostly night-time casualties. The Central American section of the RKZ includes a wonderful Amphibian Exhibit. Do you remember that video game, Frogger? I’m convinced it was inspired by a road trip in Costa Rica. In one area, I cycled a road so thick with dead frogs that I didn’t even see them at first. They simply appeared as a pattern; flat frog silhouettes covering the road like a leathery blanket. Birds, insects, arachnids, and gastropods also have extensive exhibits, but perhaps the Road Kill Zoo’s most exciting attraction is its collection of mammals. It includes monkeys, sloths, anteaters, armadillos, capybaras, and camelids, as well as less-exotic beasts; horses, donkeys, goats, cats, rats, and dogs. One of the best-preserved examples of mammalia roadkillia I’ve seen recently was a southern tamandua anteater (Tamandua tetradactyla) in the Chaco region of Paraguay. It must have died only minutes before I found it – the tiny amount of blood was still half wet, frying to the blacktop in the intense heat. Other mammalian exhibits aren’t quite so intact. The most stomach-turning road kill I ever saw was on a busy highway, while riding into Maracaibo, Venezuela; appropriate since Maracaibo is Latin America’s most stomach-turning city (but I’ll get into that another time). A horse (or what was left of it) lay crossways on its side over a concrete divider in the middle of the road. Trucks and busses hammered over the viscera, flaps of hide, and rivers of blood which ran to the gutters on either side. 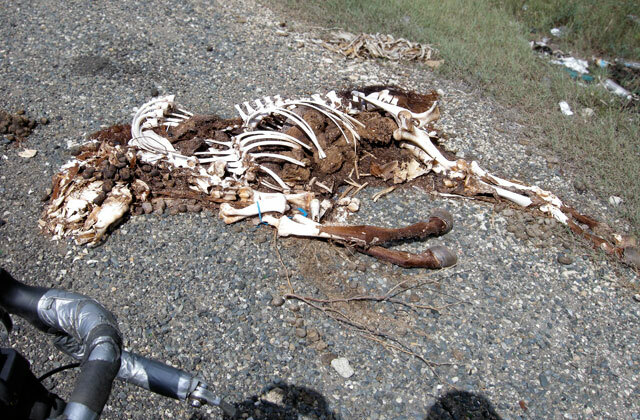 Unfortunately for the horse, he had become another exhibit in the Road Kill Zoo. Unfortunately for me, I rode straight through a giant puddle of blood before realizing what it was and I spent the evening cleaning dried blood from my legs and bike. Tell me about your visit to the Road Kill Zoo. 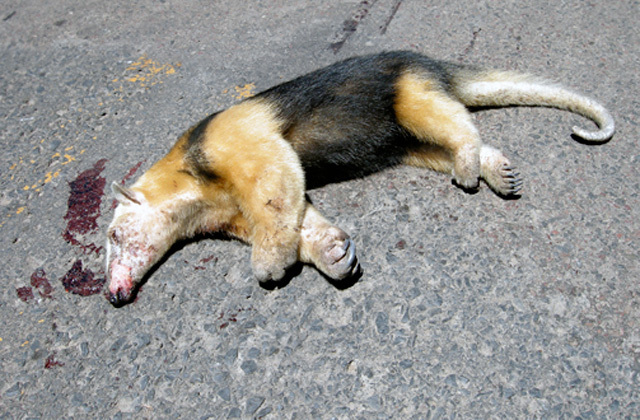 What exotic road kill have you seen in Latin America? Where were you riding when you saw it? Share your comments below. Feature image (top of page): Another sickening exhibit in the Road Kill Zoo. Dominican Republic, on the way to Monte Cristi.